Aluminium Wiring was used in the late- 1960’s- early 1970s after the price of copper sky rocketed, and aluminium became a cheaper alternative. The danger of aluminium wiring became apparent in the 1970’s after many house fires resulted due to complications with the wiring. New homes were no longer done with aluminium wiring but it was left to homeowners to make the changes to aluminium wiring within their homes. 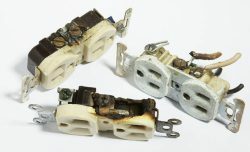 Aluminium Wiring becomes dangerous where the wires connect to the outlets or switches. Aluminium contracts at twice the speed of copper wires, which results in the aluminium wire connections loosening the connection to the outlets and switches. Another major issue is aluminium wires will oxidize. When the aluminium is exposed to oxygen in the air, a white bathroom scum like substance(aluminium oxide) can develop on the wire and cause resistance where wires are joined together. There are many signs you may have aluminium wiring in your home, some more obvious then others. It may cause fixtures to work intermittently, your walls or fixtures may be warm/hot to touch, the smell of melting or burning coming from walls, or even yellowish-brown discoloration to fixtures. The solution is not to replace all the wiring in the entire home, but to call a certified technician and have them attach a piece of copper or a “pigtail” to the wire to connect with the fixtures.